Kara Lyven and Marianne Drexler wake up every day and go to work at Duke University Medical Center — the very place that saved both their lives. Lyven is senior associate for patient safety at Duke University Hospital. Drexler is program coordinator for the Longitudinal Clinical Skills Foundation course in the Duke School of Medicine. In this episode, they share their patient stories, and reflect on how their experiences help them find joy and gratitude in everything they do. Kara Lyven: Just before I actually started working here at Duke, I had accepted a new job to work here in patient safety, but about three or four weeks before I was getting ready to start that job, I was doing what I do every morning, which is go exercise. Karishma Sriram: This is Kara Lyven, Senior Associate for Patient Safety at Duke. Kara: And this particular day, about eight minutes into my bike ride—fortunately the bike was a stationary bike—I had this pounding headache. It was the worst headache of my life. So I promptly got off of the bike and I went inside and within minutes I recognized that something was very wrong. My husband was home and he said that I should see a doctor and my first impression was, I don’t have time for a doctor, I have to go to work, I have to get the kids to camp, I have to do all these things that a normal working mother would do. But then I soon realized I needed to get some help, because I was pretty sure I was having a stroke. I had a couple of the classic signs of stroke. Not all of them, but I did have slurred speech and my face was lopsided, my smile was crooked. Karishma: So Kara’s husband called 911, and when the ambulance came, Kara insisted on coming to Duke University Hospital. Kara: Which was probably not where EMS would have taken me based on where I live, but I insisted to come here and I’m so fortunate that I did, because they worked very quickly. And it turns out that I had a hemorrhagic stroke which is a bleed in my brain. And probably within about four hours of arriving to the hospital I was in the OR having a craniotomy, which was scary, and absolutely not something that you wake up in the morning to go exercise think that you’re going to end up having brain surgery a short time later. Karishma: This is Voices of Duke Health. I’m Karishma Sriram. Today—two stories from people who work in medicine, about what happened when they found themselves in the patient’s shoes. And then, how that changed their outlook on life. You’ve met Kara. Now, here’s Marianne Drexler. She’s a program coordinator for the Duke Medical School. Marianne Drexler: Four years ago, after the birth of my last child, I experienced a massive postpartum hemorrhage, that was completely unexpected. And I was told that I was going to be going in for a DNC which would be relatively quick. And I woke up five hours later on a ventilator in the ICU, and was then told that I needed a hysterectomy to save my life, and spent several days away from my- both my children, actually, but especially away from a newborn. And so that was really challenging and was a lot to take in as a new mom, or with a new baby. And, you know, it was one of those situations where one of the best days of your life was also one of the worst days of your life, and coming to terms with that was not necessarily an easy process. Karishma: And Kara had some things to come to terms with, too. Like, when could she go back to work, to support her family? Could she go back to work? Kara: If you think about being one of the- the main supporter of your family and then you became suddenly ill, and you have a young family still, it’s really scary to think about how to balance all those things. And leaving a job, not sure what the new job- if I’m going to be able to do it, if they’re gonna want me to do it, in whatever state that I come through this mentally and physically. Once I got through the rehab piece and there was sort of a light at the end of the tunnel that I knew, at least mentally, I was intact. The next piece was really trying to figure out how to, of course, physically get back so that I could get back to work. And I think I put a bit of pressure on myself to do that sooner rather than later because I am a working contributing person in my family. But I guess one of the biggest things for me is that, I joke that I probably should have been paid while I was a patient here at Duke because instead of me paying all these hospital bills, I was really going undercover as a patient safety officer for the hospital. I was going undercover as a patient before my actual job started, so it was really quite rewarding in that way, to see how the care really is delivered and see how the teamwork actually happens and to really be a part of what I then was gonna work with. Did your experience have any impact on your career? Marianne: So it did, actually. I have been at Duke for 12 years now. But, you know, in higher education for a lot longer and after this experience, I really wanted to do something more medical. But I didn’t have any kind of medical background. And so, you know, I didn’t really know how to merge that. And then I found a position available at the School of Medicine and it was actually the perfect blend of working in higher education and also working in medicine. And so now, you know, my role is to work with medical students and with faculty. And helping to engage medical students in learning about the patient experiences is one of the things that I get the pleasure of doing, and so Kara, that’s actually how we met is engaging you as a patient speaker for our students. Kara: Right, which has been amazing. I can only imagine for you, to be able to bring your patient experience into your work that you do every day and help you drive the development of future providers is pretty rewarding. And for me to be able to come in and share my story as a patient, and specifically talk to them about communication and empathy and what that means from a patient’s perspective, has been very rewarding and I hope that being able to share my experience, not only as a patient, but as a patient safety professional, to be able to blend those pieces together helps to show that there’s a balance in that relationship. Hopefully nobody has to go through what either of us went through to really see and feel the patient perspective, but to be able to share that through stories has been a really powerful at least for me to be able to grow with my experience. Marianne: Yeah, I agree, I think it’s a really healing opportunity to be able to share our patient stories with future clinicians and current clinicians as well. And, you know, that’s something I’m really grateful for, to have that experience. And what kind of things have brought you gratitude, in your experience? 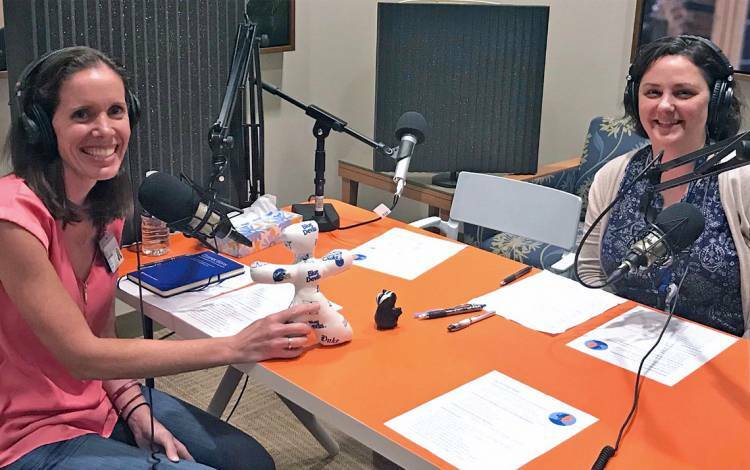 Kara: Certainly in my professional life and patient safety world, I always bring the patient’s perspective to that table, so that’s really gratifying that the work that I’m doing really is putting the patient first. And again that’s the reason that we’re all here. But generally speaking, the gratitude that I have, having been a patient, is so much greater than it was before. And I really can honestly say that waking up every day and coming to work at a place that literally saved your life is without a doubt the most rewarding experience that anybody could ever ask for. Karishma: And that’s because it completely shifted the way they approach life. Their experiences have helped them find joy and gratitude every day. Kara: Having been a patient in a very serious, potentially life-threatening condition certainly has made me have a different outlook on life. And of course, you hear from a lot of people that, you know, you enjoy every moment and you live for the day because there may not be a tomorrow. But I think it’s really taught me a lot of things about being brave and being humble and perseverance, and just so many things that for me helps me on a daily basis, to think about those things. And I know for the rest of my family and particularly for my kids, as I’m trying to raise these young kids to be awesome, amazing adults, to have them learn from that experience and to learn from my strength and my bravery and how we cope and deal with a really difficult situation. Kara: If I could rewrite my personal history, I absolutely would not write that part of that out of it. The part of becoming sick. Marianne: I agree, yeah, I wouldn’t change it. Because it’s opened my world in ways that I could never have expected. It’s turned me into the role of an advocate, which was totally unexpected for me. And that wasn’t something I was ever envisioning for myself or looking for. But it sort of just landed in my lap, and it became a thing that I really felt like I had no choice in the matter, became something that I just had to do. Because I saw all of the issues that were happening around maternal health, especially in the United States, and I just felt like I had to lend my voice to this. And so that experience definitely gave me a new perspective and something to really work for and be an agent of change. And so for that I really appreciate having gone through what I went through. Kara: Right. I mean even here within Duke, to be able to advocate for improved patient care through the PFACs—the Patient Family Advisory Councils—has been rewarding. I know we both sit on different PFACs, and it’s probably one of my most favorite meetings and it’s not one that I’m paid for because it’s, you know, it’s part of my volunteer role when I sit here as a patient and not as an employee. And it’s just very rewarding to be able to have an impact. And very cool for me that I got my husband pulled in and he sits on a PFAC as well, to try to provide the family perspective, because that is- patients are important, but the families are the ones that are also emotionally dealing with a whole lot of uncertainty. And I tell my husband all the time, that when I was sick that I had the easy job. I just had to lay in the bed and heal. And he had the really hard job to keep everything still moving forward. And the uncertainty of what was, was weighing on his mind, where I just got to sleep and watch TV all day while I was in the ICU, which was certainly hard and not good or fun but not as emotionally draining as his experience. Marianne: Yeah. And I think we realized that the patient experience, the patient voice, is so needed in our healthcare setting, that we need to be able to engage the patients and what the experience is like for them. I mean, we know what it’s like to wake up on a ventilator. We know what it’s like to lie in a hospital bed in the ICU. We know what it’s like to be separated from our children. And, you know, maybe not everybody in the healthcare setting gets that and that’s something that I think we can bring to the table in a way that’s really important. Karishma: A big thank you to Kara and Marianne for sharing their stories. In this episode, Kara mentions the signs of stroke. 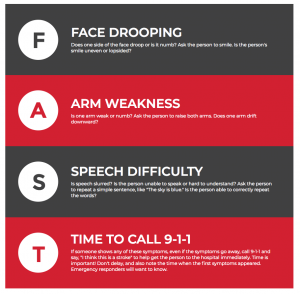 We want to make sure everyone knows the 5 signs that indicate stroke—numbness, confusion, trouble seeing, trouble walking, and severe headache. For more information, see [below]. Kara Lyven was featured in this Duke Health video in 2017.